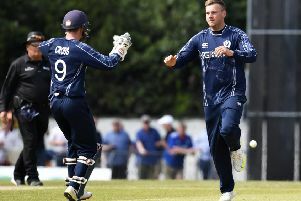 Mazars Grange player/coach John Blain believes Preston Mommsen will be a quality addition to their squad after it was announced that the Scotland cricket captain was moving to the club from Capital rivals Carlton. The arrival of the 28-year-old all-rounder is a real statement of intent from Grange as they look to build on last year’s CSL Eastern Premiership and Grand Final double success. Mommsen has been one of the most consistent performers in the east in recent years and next Monday will head off with the national side to the World Twenty20 event in India. Blain said: “We are delighted that Preston will be playing for us in 2016. We have all played against him in recent years and know just what a good job he can do with the bat and the ball. “As Scotland captain he is also a very hungry player and he will help drive standards up throughout the club.